SEOUL - The leaders of North and South Korea on Friday held only their third summit since the end of the Korean War in 1953, with Pyongyang’s nuclear arsenal and a peace treaty to formally end the conflict on the agenda. The meeting comes ahead of an expected but unprecedented encounter between North Korea’s Kim Jong Un and U.S. President Donald Trump. 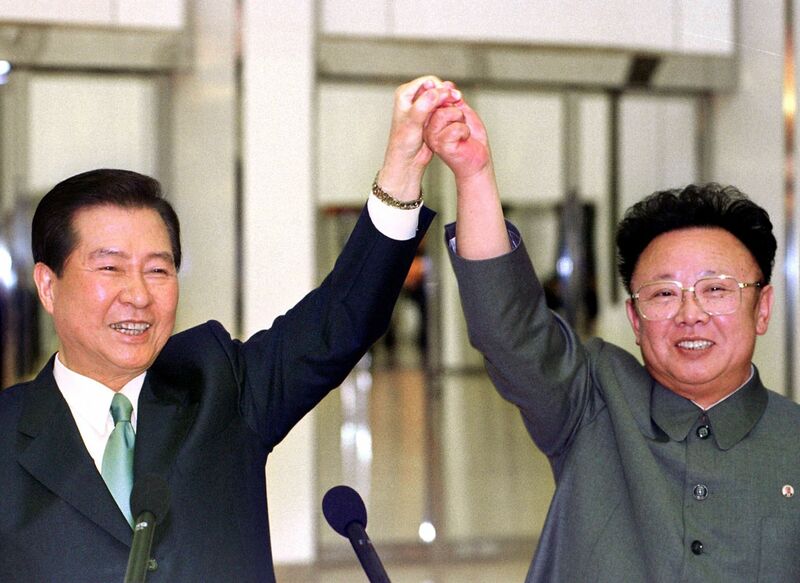 The first inter-Korean summit nudged the two Koreas away from Cold War confrontation toward reconciliation and exchange. North Korea’s leader, Kim Jong Il, surprised the world with a rare foray into the international spotlight by going to the airport to personally greet South Korean President Kim Dae-jung, in emotional scenes broadcast live in the South. Hundreds of thousands of people, women wearing colorful traditional robes known as “hanbok” in the South and “joseon-ot” in the North, men in suits and ties, all waving red and pink paper flowers, lined the streets to give Kim Dae-jung a carefully stage-managed hero’s welcome. “I am happy to see you, I have wanted to for a long time,” the visitor told his host. “We are the same Chosun (Korean) people,” said Kim Jong Il. During the three-day visit, the pair signed an accord on reducing tensions and boosting efforts for reunification, including moving toward a permanent peace on the Korean Peninsula — which has remained technically at war since the 1953 cease-fire — and bringing together divided families. But while the summit helped earn Kim Dae-jung a Nobel Peace Prize, it later emerged up to $500 million had been paid secretly to North Korea just before the meeting via the Hyundai business group, with critics denouncing what they called a “cash-for-summit” scandal. Hyundai had various projects in the North including tours to scenic Mount Kumgang, but they came to a halt in 2008 when a South Korean tourist was shot dead after stumbling into an off-limits military zone. The Seoul-invested Kaesong industrial park was shut down in 2016 after the North’s fourth nuclear test. The second summit came amid an upbeat mood in six-nation negotiations over North Korea’s nuclear disarmament, despite its first nuclear test a year earlier. In a highly symbolic gesture, South Korean President Roh Moo-hyun walked some 30 meters across the heavily fortified border before returning to his motorcade to carry on to Pyongyang. The frontier “has divided the nation for half a century. It has caused enormous pain to our nation and hampered development,” he said in comments televised worldwide. Roh said later that he was unable to sleep on his first night in Pyongyang as he felt “formidable differences in thought” with the North. “I was not sure whether we could agree on a single point,” he added. 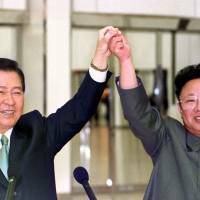 But the two leaders signed a declaration calling for a nuclear-free peninsula and a permanent peace pact between the two Koreas. “The South and North will not take a hostile stance toward each other and will reduce military tension and resolve issues of conflict through dialogue and negotiation,” the declaration said. They agreed to step up trade, travel and political exchanges, and to hold summits frequently in future. At the end of the meeting, Kim shook hands and clinked champagne glasses with Roh, who was visibly upbeat and planted a tree before he left Pyongyang. International reaction was more lukewarm than after the first summit, with the United States saying that Korean peace hinged on the North’s agreement to dismantle its nuclear weapons program. The South’s “Sunshine Policy” of engaging with the North came to an end when the conservative Lee Myung-bak came to power the following year, and in 2009 the North walked out of the six-party talks before carrying out its second nuclear test. Kim died in 2011 and was succeeded by his son, Kim Jong Un, who oversaw a rapid acceleration in the progress of its nuclear and missile technology — accompanied by increasingly strong sanctions by the U.N. Security Council and others — with tensions mounting until the rapprochement triggered by this year’s Winter Olympics in the South.